NEPALGUNJ, April 30: Excavators are seen extracting sands and gravel from Samshergunj area of Rapti river round the clock. Mini and heavy trucks transport them to the crusher machines lined up on riverbanks and from there to their final destinations. Locals are concerned but have remained silent as they are told that stones and sands are mined to supply construction materials for the Hulaki Sadak (Postal Highway), a long awaited dream project that is supposed to have a great impact on the economy in the plains. "The mine owners claim that the sands and stones on the river bank are mined for the construction of Hulaki Sadak. However, we feel that something else is going on. It cannot be only for the highway. In the name of the highway, they are carrying sands and gravel stones elsewhere as well," said Maimkala Rana of Samshergunj, Raptisonari-2. "We can see the river bed is being destroyed by massive excavation of sand and stones every day. When we try to protest about it, they silence us stating that it is for the construction of the highway," she wondered. Locals have no idea how much sand and stone has been excavated out from the river's bank so far. However, they are extremely worried about the repercussions like floods. They are concerned that such rampant excavation could make their settlements vulnerable to flooding. "We are anxious than ever. When you take out all the sand and stones from the river's bank, obviously settlements on the banks of river will be at a greater risk of flooding," noted Rana further adding that, "We have already faced floods earlier." According to Rana, crushers on the riverside operate round the clock and claimed that they can hear the noise of the machine in the dead of the night. "The machines have been crushing the stones all the time and the scale at which they are excavating and crushing stones, it looks really worrisome," Rana said. Based on these suspicions, the locals even took to the streets demanding official inquiry into the matter and urging the authorities concerned to put an end to the reckless excavation of sand and stones by forming the Rapti River Conservation Struggle Committee. Raptisonari-2 resident, Dilli Giri, who heads the committee, informed to Republica, that they have discussions with police officials and the Chief District Officer over the matter. However, their concerns remain unaddressed so far. "We went to the CDO, police officer, other local bodies which could help. So far, none of them have taken the matter seriously and tried to allay our concerns," said Giri. "When floods hit, it is poor people like us who are affected. The government is not going to take care of us even then," he fumed. While expressing concerns about the excessive extraction of sand and stones from the riverbank, he also claimed that the miners might be extracting by going beyond the permissible limits. "In excavating stones and sand, operators have been flaunting mining as well as environmental regulations. They operate crushers and excavators round the clock. We can't even sleep properly. This is not development but destruction of environment," he said. Ganapati Group of Construction Company, the firm that has taken the responsibility for the construction of the highway, has informed that there is no need of extracting stones and sand from the river. Tulasi Ram Bhandari, Managing Director of the firm, claimed that they have sufficient stock of such construction materials. "Presently, we are graveling some sections of the highway. However, for that we don't need fresh supplies of sand and gravel stones as we using our stocks piled up in Dhalaiya and Fattepur last year," he said. 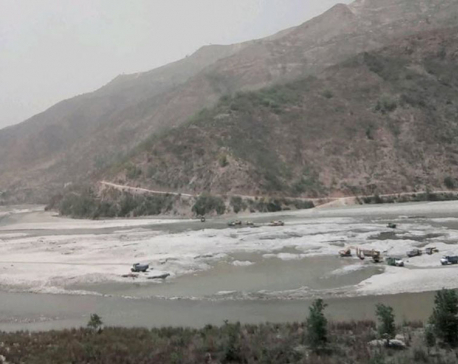 While informing that company's crusher operation on the river bank have not been registered, he claimed that the plants have been working only to supply raw materials for completing the highway. He claimed that other groups might be involved in excavating stones and sands from the river on the pretext of the Hulaki Highway. "That is quite possible. In absence of proper monitoring, anyone can do that. It is quite easy to do so," he maintained. Chairperson of Raptisonari Rural Municipality, Lahuram Tharu, conceded that crushers have been operating unabated on the riverbank and claimed that they have recently mobilized officials to monitor them. "We are aware and concerned about the rampant excavation of stone and sands on the riverbank. So, we have deployed staffs to monitor it," he said.